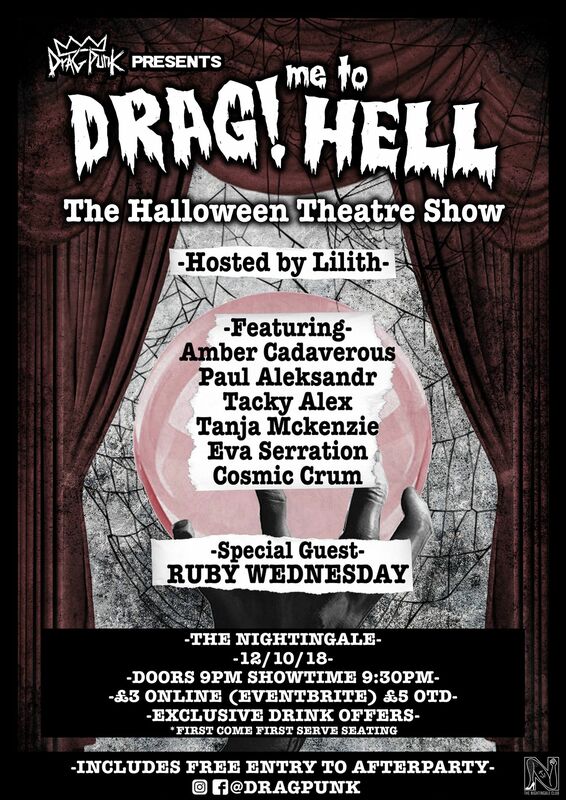 On Friday 12th October, the Dragpunk collective are back for another show – returning to The Nightingale with Drag Me to Hell! Appearing at Drag Me to Hell! will be the whole Dragpunk collective – Amber Cadaverous, Paul Aleksandr, Tacky Alex, with Lilith as the evening’s hostess – joined by Cosmic Crum, Tanja McKenzie, and Eva Serration. There will also be a special guest appearance from Ruby Wednesday, who is flying The Familyyy Fierce nest for a night to sit glacier cherry style on the evening’s proceedings in Birmingham. For direct links to online ticket sales for Drag Me to Hell! visit Eventbrite by clicking here. Or for more information on the show, visit the Facebook Event page by clicking here. Dragpunk Presents’ first show back in April, Candyland, was a showcase of the collective’s great, good and covered in condiments – ‘showcasing local and national UK drag of all genders, sexualities and abilities that you’ll adore!’ Check out Emily Doyle’s illustrated Birmingham Review of Candyland by clicking here. But there’s more to Dragpunk that shock, horror, and baking ingredients abuse – the local ‘collective of creative queer-minded people’ are strong advocates for artistry and inclusivity, promoting shows that create ‘a safe space for self-expression’ for every friendly face that attends. Dragpunk’s latest offering, Drag Me to Hell! is also a shimmy/shake into more theatrical territory, with the set piece showcase conveyor belt making way for a narrative led production. Dragpunk Presents: Drag Me to Hell! at The Nightingale Club on Friday 12th October. For direct links to online ticket sales for Drag Me to Hell!, visit Eventbrite by clicking here. Or for more information on the show, visit the Facebook Event page by clicking here.